This trail in Zion Canyon has you walking on top of a massive landslide. It is primarily used by the horse concessionaires. As such, many portions of the trail smell accordingly and are very sandy making for difficult walking. While the beginning of the trail is in the trees, it breaks out into the sun offering little respite from the heat on sunny days. While it offers a few nice views, most notably that of the Streaked Wall and the Court of the Patriarchs, the effort involved makes this hike less palatable than a majority of the other hikes in Zion Canyon. Start at the Zion Lodge and cross the footbridge over the Virgin River. At the trail intersection, head left. You’ll follow the Virgin River’s west shoreline in the trees, on a trail that often features deep sand and trenches making walking difficult. The trail wraps around Mt. Moroni and enters into the Court of the Patriarchs with their fantastic towering walls. Views across the canyon are equally as impressive. You’ll cross over Birch Creek, which requires a bit of strategy as there is no footbridge and, depending upon flow, should be able to be navigated without getting wet. A short but steep climb gets you up onto Sand Bench where the trail forks to make a loop. Take the left fork and navigate the trail clockwise. Doing so will take you down a long sandy hill later in the hike instead of the very difficult climb up. The trail continues to climb up onto the bench and eventually looks down onto the river and the road. From here, you can really see that you’re on a landslide as the ground below you isn’t the slickrock and smooth sandstone found on many of the other trails. With less traffic than other trails in the canyon, wildlife such as Desert Cottontails and Mule Deer are more easily spotted. The trail comes around to the base of The Streaked Wall, which is appropriately named for the mineral streaking featured on the rock. Around the head of the loop, you’ll find a stopping area used by the horse concessionaires. Continuing on, you will walk through more of the same desert sagebrush, cactus, and grass. You’ll come to a steep section with deep sand and, as mentioned earlier, is easier to navigate by going down than up. Shortly after the slope, you’ll come back to the junction where you started the loop. Head on back to the Zion Lodge the same way you came. 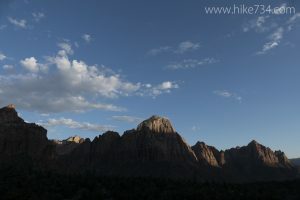 To make the hike shorter on your return, you can take a spur trail (near a split rail fence) to the Court of the Patriarchs where a footbridge will take you over the Virgin River, past a corral, and to the bus stop.